The College of Forestry’s world-class students and faculty conduct ground-breaking research within the subjects of forestry, natural resources, tourism and wood science and engineering. Our research happens in labs and outdoors– on public and private lands across the state and in the College’s own 15,000 acres of College Research Forests as well as around the nation and the world. 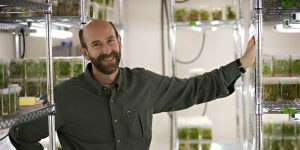 Contributing to Oregon State University’s second-best year ever in competitive grants and contracts for research, the College of Forestry received $11.04 million in new grants and awards. As Oregon’s largest comprehensive public research university, OSU earned a total of $382 million in the fiscal year ending June 30. Industry and agency partnerships thrived via the college’s 10 research cooperatives, with more than 100 private industry and government agency members providing an additional $2.18 million to support collaborative research. Here are some examples of newly funded research out of a portfolio of 40 new projects. This project will provide new information on how managed forests support healthy pollinators including bees, flies, butterflies, beetles and hummingbirds. Other objectives of the project include determining how pollinator health is influenced by forest management intensity, evaluating whether management changes to pollinator communities alters pollination of wild plants and testing whether forests serve as source habitats for pollinator populations within agricultural landscapes. The goal of this project is to develop and test systems to edit floral genes of poplar and eucalyptus trees. The edited, non-functional genes should prevent the release of pollen or seeds of these species because their genetically engineered forms are considered undesirable. These trees are often propagated from cuttings, making fertile flowers unnecessary for commercial use. These tools are expected to simplify regulatory decisions, promote public acceptance, and avoid unintended effects from exotic or genetically engineered trees in wild or feral environments. Landslides are increasingly frequent hazards that affect the operation, maintenance, and construction of Oregon highways, resulting in negative economic, environmental and social impacts for Oregon communities. This project will develop approaches towards creating enhanced means of assessing landslide risk considering topography, rainfall, and seismicity, primarily through the creation of mapping tools. Through these endeavors, planners will be able to maintain the safest and most efficient transportation system possible. Inventoried landslides used for future projections of landslide hazard. This project is developing protocols to monitor recreation use across 21 units of Golden Gate National Recreation Area, the most heavily used National Park in the US. The impacts of timber harvesting and other land uses on water quality have been an environmental concern for many years. This project will assess the effectiveness of the rules currently applied in California. These rules are aimed at identifying headwater streams that require special protection given their likelihood to influence stream temperature in downstream watercourses. This project will assess the vulnerability to temperature increases after timber harvesting of fish-bearing streams draining different geologic units. The project will explore fungi-derived pigments as a sustainable optoelectronic material for organic photovoltaics. Wood stained fungi native to the Pacific Northwest will be explored for potential incorporation into solar cells. Fungi-derived pigments are abundant and represent a largely unexplored resource for organic electronics and renewable electricity generation. The project is in conjunction with principal investigator Oksana Ostroverkhova in the College of Science. This project will support the growing need for land managers to fully utilize Lidar products to obtain timely and accurate information. The project integrates traditional measures of fuels with remotely-sensed point cloud data to provide estimates of pre- and post-fire fuel mass, volume, or density in physical measurement units and in 3D within the same domain as physics-based fire models, and to scale up observations from fine-scale inputs to physics-based models to coarse scale fuels characterization required by smoke models. Hierarchical sampling across a range of spatial scales will also provide an important sensitivity analysis at varying scales. The purpose of this research is to investigate management policies to address wildfire impacts to human and ecological values. Current suppression policies are not financially sustainable and not desirable from an ecological standpoint. This project will test moisture intrusion and biological decay in cross-laminated timber connection systems to help architects, contractors and product supplies understand how connections in wood buildings will fair over time.